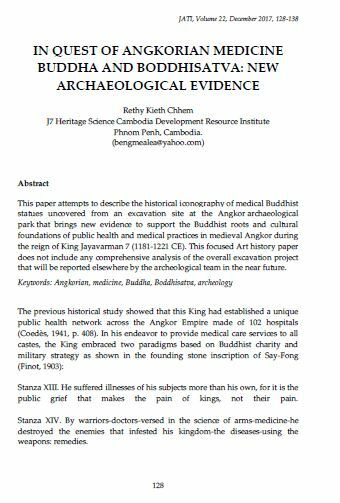 This paper attempts to describe the historical iconography of medical Buddhist statues uncovered from an excavation site at the Angkor archaeological park that brings new evidence to support the Buddhist roots and cultural foundations of public health and medical practices in medieval Angkor during the reign of King Jayavarman 7 (1181-1221 CE). This focused Art history paper does not include any comprehensive analysis of the overall excavation project that will be reported elsewhere by the archeological team in the near future. CHHEM, Rethy Kieth. IN QUEST OF ANGKORIAN MEDICINE BUDDHA AND BODDHISATVA: NEW ARCHAEOLOGICAL EVIDENCE. JATI - JOURNAL OF SOUTHEAST ASIAN STUDIES, [S.l. ], v. 22, n. 1, p. 128-138, dec. 2017. ISSN 2600-8653. Available at: <https://jati.um.edu.my/article/view/10250>. Date accessed: 20 apr. 2019. doi: https://doi.org/10.22452/jati.vol22no1.9.